I usually only post on Monday and Thursday, but I could not resist this fun tag! I was tagged by my friend Ashley at The Mixed Bag to get a bit more personal, so I am joining the Blogger Tag to share a little more about myself. I am tagging my friend Jill from Doused in Pink to play long if she would like! 1. What was the reason for you getting into blogging? I honestly started it just as a personal blog to chronicle the renovations we have been doing on our 1960's Ranch home. I thought it would be fun to look back and see how far our house had come. I had hopes that one day I could turn it into a "real blog" to help DIYer's like me and my husband, since we learned a tremendous amount from reading DIY blogs. 2. What advice would you give to someone just starting out in blogging? It is so much harder than you think and it is not a get rich quick scheme. It takes hard work with writing posts, editing photos, posting on social media...the list goes on and on. I would say to start out slowly and find other blogger friends to mentor and encourage you. Don't get hung up on all the "Rules" of blogging, like how often to post or needing to sell something. 3. 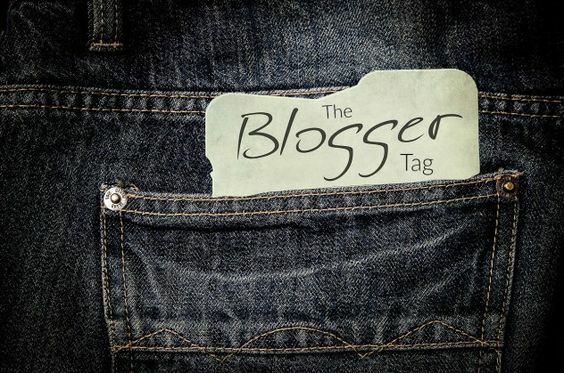 What does your friends and family think of you blogging? My husband supports me and thinks its great (maybe except when I make him stop mid project to take pictures!). I haven't really told the rest of my family or many of my friends, since it is mainly a hobby at this point. I do not really know how to explain it to people and most would not understand anyway. I didn't really "get" blogs either until we started following several for DIY tips, when we embarked on our home renovation journey. 4. What’s your favorite thing(s) about blogging? I love writing...English was my favorite subject in school and I loved reading and writing papers. It gives me a creative outlet and a way to spend my free time, especially since my son is older. I also like blogger perks, such as getting free stuff to try out! One other thing I love is the tight knit blogging community. I would have never have dreamed of the support and encouragement I get from so many other bloggers at all points in their blogging journey. The ladies I interact with on a daily basis are so kind and open to answering questions, which is so helpful when you are a newbie. 5. What’s your least favorite thing(s) about blogging? My least favorite thing about blogging is stressing about my numbers. It is sometimes discouraging to not grow as fast as I think I should. 6. Share ONE of your favorite posts that you’ve done and feel proud of! I am proud of this post because this was one of my first DIY projects that I did mainly by myself, and it turned out amazing! 7. What are your blogging goals – short-term or long-term? Short term, I want to focus on getting paid sponsored posts and attend my first blog conference in August. Long term, I would love to be able to earn enough income to be able to trade in a corporate job for a part time position that is more meaningful, such as working for a non-profit, so I can also spend more time volunteering for charity. LiveLoveDIY was one of the first blogs I started following. Virginia's house is much like ours and she and her husband do most of their renovations themselves. I love her decorating style and her humor. Young House Love is another one of the first blogs that I started following and we actually followed their instructions when we updated our front porch column. They have renovated 3 homes and are my DIY idols! If you read my "About Me" page, you would know that I am a 1st degree Black Belt in Tae Kwon Do, which is one of my proudest achievements. I am super frugal...which probably does not come as a surprise since I shop at thrift stores and DIY everything! I have even been known to try to save used aluminum foil...until my sweet husbands reminds me that we are not living in the Great Depression. I am a self-taught "computer nerd." My degree is in Accounting, but I switched positions a few years ago and became the sole Admin of my company's sales software, which required me to learn basic programming and coding skills. Little did I know how handy the HTML knowledge would be while building my blog! 10. What would be your dream blogging opportunity? I would love to work with a major brand such as World Market, Wayfair, or Pier One and do a whole house home decor series! I hope you enjoyed getting to know me a little better! If you want to play too. share with me your blog post in the comment so I can go read it; I’d LOVE to learn more about you too! That is true...slow and steady wins the race! HAHAHAHAHA! Thanks again for the tag! No matter what "level" of blogging I reach, I find that I always stress about numbers! I'm doing all of my dream blogging jobs that I started out wanting, and I still stress about it! I loved learning more about you! You have an amazing blog and I'm glad we connected through blogging! It's hard not to stress out about numbers, but you'll get there! It would be fun to work with World Market or Wayfair! Thank you so much for the tag! Hope you are enjoying the weekend! Thanks you for the sweet compliment and I am glad we connected too! I love your blog as well! Thank you for visiting and reading Emily! I love reading posts like this to get to know my blogger friends better! Thanks Monica! I love your makeup posts and your pics are always to die for! We will make it together! I had no idea you were a black belt! That's quite an achievement! I'm a TKD mom, so I understand how much goes into it! So glad I read this and got to know more about you! Thanks for your kind comments, Robin. It really is hard, and I would not have thought I could do it until I did!